The heirs of Johan Cruyff, represented by Interclarion SL reserve the right to prohibit commercial use of Johan Cruyff’s name, photographs and/or images taken during private, public and professional appearances. Such use could damage the manner in which the heirs of Johan Cruyff wish to exploit the photos, images and person of Johan Cruyff. At all times, the heirs of Johan Cruyff will want to decide how (i) Johan Cruyff’s photographs or images in print (including books and magazines) are used, (ii) Johan Cruyff’s images or fragments of matches in movies or documentaries are used, or (iii) his name is linked to commercial initiatives or charities. The unauthorised use of Johan Cruyff’s picture and image in print (including in cartoon form), on image- and sound carriers and in electronic publications taken during a private, public and/or professional appearance is not permitted. The use of the signature of Johan Cruyff and original texts and statements that have been made public by Johan Cruyff during interviews, speeches or in print, is not permitted without the prior written permission of Interclarion SL and may be dependent on (financial) conditions. 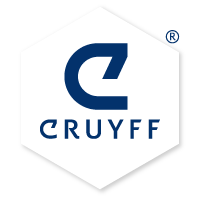 The marketing of goods and/or services (merchandise) under or on behalf of Johan Cruyff trade names, trademarks and/or logo’s is prohibited without the prior written permission of Interclarion SL and may be dependent on (financial) conditions. Interclarion SL reserves the right to update and/or amend the Johan Cruyff exploitation policy disclaimer without further notice and at any time. In order to stay informed about possible changes, it is recommended to consult these terms frequently.